Pirates Adventure is a purpose built indoor family entertainment centre in Tramore, Wexford, offering a wide variety of leisure activities all built around a pirate theme that are fun for kids and all the family . So whatever the weather, the whole family can enjoy a fun and exciting day out at Pirates Adventure centre. It is a fantastic, place that will keep the kids busy for hours on end. 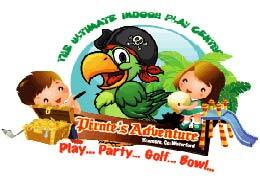 Pirates Adventure is suitable for children 3 years and upwards, although ideally suitable for 6 years to teenagers. Perfect fun for all the family – both kids and parents can get involved in Pirates Adventure 12-hole indoor mini golf course complete with Ireland’s first ever glow in the dark section. 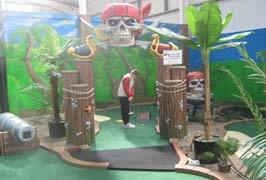 Have fun and test your skills as you putt past pirates, waterfalls, sea serpents and firing cannons. 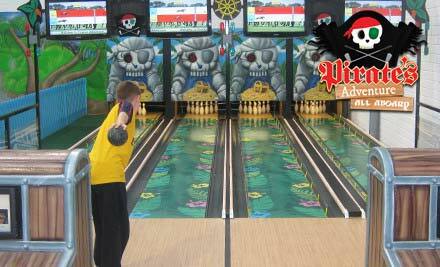 Pirates Adventure offers you the ultimate mini bowling experience which is brand new to Ireland and similar to regular ten pin bowling, the lanes are a little shorter and the balls a little lighter, making it easier for children. You can also check the kids mini motorbikes which are great fun and there is also a arcade games. What better way to start or finish your trip to Pirate’s Adventure than a visit toThe Buccaneer Bites Café, which serves delicious home made snacks and refreshments. Please note: They are open 7 days a week during all School Holidays. Pirates Advanture also do a great range of kids birthday parties with options including. Play on the Pirate Ship, hot food (choice of chicken goujons or sausages and chips) party bag for every child attending, invitations, popcorn and unlimited juice. A free tea or coffee for the parents of the birthday child and a present for the birthday child. Party host provided for serving of food and cake ceremony. Minimum 10 kids per party. One child free with parties of 15 or more. Play on the pirate ship, motorbike rides, hot food (choice of chicken goujons or sausages and chips) party bag for every child attending, invitations, popcorn and unlimited juice. Party host provided for motorbike rides, serving of food and cake ceremony. *Have your party before 12 Sat/Sun/Hols and get €2 off per child!! Play on the pirate ship, games of mini-golf, hot food (choice of chicken goujons or sausages and chips) party bag for every child attending, invitations, popcorn and unlimited juice. Party host provided for mini-golf games, serving of food and cake ceremony. Play on the pirate ship, games of bowling, hot food (choice of chicken goujons or sausages and chips) party bag for every child attending, invitations, popcorn and unlimited juice. Party host provided for bowling games, serving of food and cake ceremony. Extras: Ice-cream cake €7Minimum 10 kids. One child free with parties of 15 or more. Play on the pirate ship, motorbike rides, games of bowling, games of mini-golf (children accompanied throughout by a dedicated party host), hot food (choice of chicken goujons or sausages and chips) party bag for every child attending, invitations, popcorn and unlimited juice. At Pirates Adventure they can cater for school tours, group outings and sports clubs. They have great packages to suit all ages and budgets and the friendly staff will ensure you have a great day out!! From Waterford city head out Cork road past all the car dealerships until you reach a roundabout on the Waterford outer ring road. Take the first exit onto a dual carriageway and continue on through the first two roundabouts until you reach the third roundabout (Ballindud roundabout). At the Ballindud roundabout take the third exit for Tramore. Continue straight on this road for roughly 13 km. Enter the town of Tramore at the roundabout and take the second exit. Continue past the GAA grounds and take the first exit at the Racecourse roundabout. Continue on this road & the entrance to Riverstown Business Park is on the bend on the left hand side. Drive straight to the end of the estate & Pirate’s Adventure is located on the left hand side of the road. From Passage East head towards Waterford city. Upon turning right onto the Dunmore Road, proceed towards Waterford city. Take the second exit through the first roundabout and take the first exit at the Hospital roundabout. Continue straight on this road, through the first roundabout. Take the second exit on the next roundabout where you will join a dual carriageway, the Waterford outer ring road. Continue on through the first two roundabouts until you reach the third roundabout (Ballindud roundabout). At the Ballindud roundabout take the first exit for Tramore. Continue straight on this road for roughly 13 km. Enter the town of Tramore at the roundabout and take the second exit. Continue past the GAA grounds and take the first exit at the Racecourse roundabout. Continue on this road & the entrance to Riverstown Business Park is on the bend on the left hand side. Drive straight to the end of the estate & Pirate’s Adventure is located on the left hand side of the road.